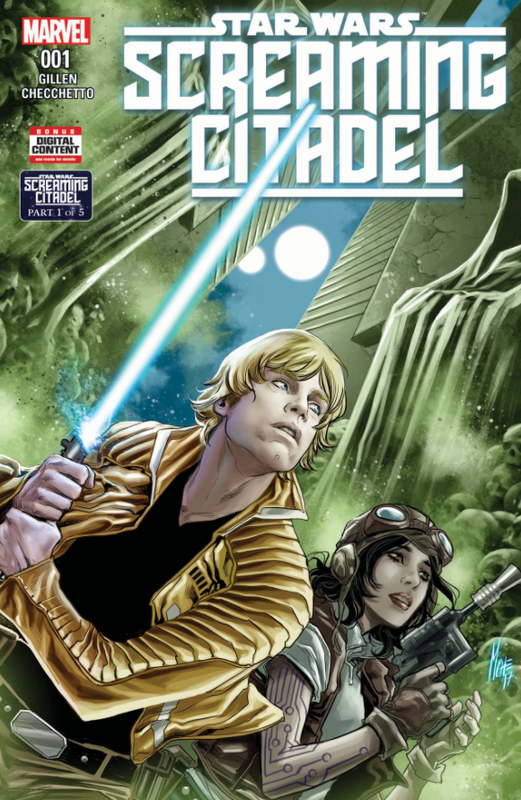 Star Wars: The Screaming Citadel #1 Review – AiPT! The start of a five issue crossover event between the series Star Wars and Star Wars: Doctor Aphra begins today! Our story takes place between A New Hope and The Empire Strikes Back, following Luke Skywalker and Doctor Aphra on a journey into the dangerous and unknown Screaming Citadel. 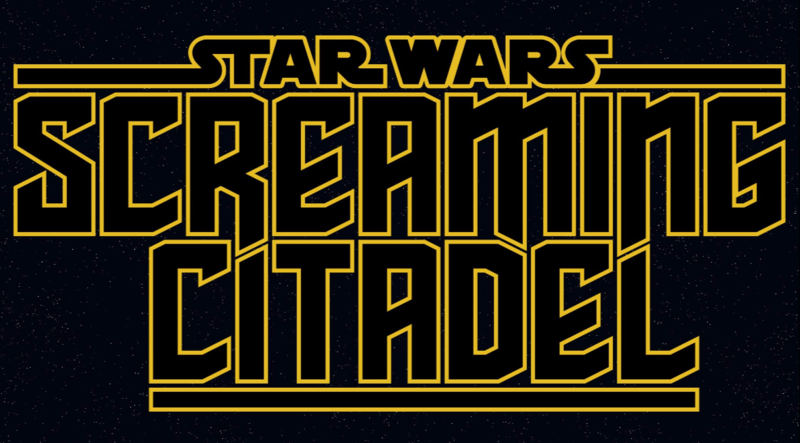 So let’s jump in to Star Wars: The Screaming Citadel and find out, is it good? THE SCREAMING CITADEL” — PART 1. Rebel pilot and rogue archaeologist wander side by side into the darkest shadows of the galaxy as Luke Skywalker reluctantly teams up with Doctor Aphra! The Doctor makes Luke an offer he can’t afford to pass up…one that leads him to a very rare gathering at the heart of the infamous Screaming Citadel. Will Luke find what he’s looking for? Can Aphra be trusted? Or will they both wind up victims of the Citadel’s Queen? It’s safe to say the last time Luke and Aphra met, things weren’t exactly friendly between the two. Kidnapping, electrocution, lightsabers and near-death encounters are just a few of the events that transpired. Thus, it would have to take something truly special for Luke to even consider, let alone agree, to teaming up with Aphra. Lucky for us that’s exactly why Aphra has dropped in Luke’s lap! "Special" might not even begin to describe an ancient Jedi artifact containing the archived personality and knowledge of a Jedi Master, belonging to an order all but extinct. To unlock the artifact dubbed by our favorite shady archeologist as The Ordu Aspectum, Luke and Aphra must journey to a fortress on the edge of the known space. There a mysterious figure, the Queen of Ktath’atn, awaits with the ability to unlock the Ordu Aspectum. On arriving to the citadel of Ktath’atn our heroes find a meek, starving and frightened populace living on the outskirts of the gothic-style fortress. There’s definitely more than meets the eye to that Queen of Ktath’atn and her servants. There’s a strong horror vibe happening here and I can’t wait to see what manifests the dark emotional undercurrent. There isn’t one. My only gripe is that I have to wait a week to get more of this story. Marco Checchetto first caught my attention with his work on Star Wars: Shattered Empire and Star Wars: Obi-Wan & Anakin. A noted long-time fan of the Star Wars universe, his passion for the mythos is impossible not to spot here. Checchetto excels at bringing out the emotion in each character, whether it’s Luke’s hesitance, uncertainty and lack of confidence in his abilities or Aphra’s mischievous, yet admirable thirst for knowledge. Nothing appears to be outside his range as he seamlessly jumps from dustball planet on the outer rim, through hyperspace, to rain-soaked ominous fortress. From start to finish, Kieron Gillen’s pacing is a extremely well done. By the end of the book there’s over a handful of characters present who you already know and the addition of a few new ones. Needless to say, there’s a lot of going on here, though I’m happy to report at no point during the story was I ever concerned by the seemingly crowded roster. The curtain over the new characters is pulled back just enough to entice and intrigue you, without giving away too much, too early. This book does a great job showcasing Gillen’s ability to properly pace a story without overwhelming the reader. Perhaps the most exciting thing to be found here are the possibilities Gillen has opened the Luke Skywalker mythos to. Should Luke and Aphra succeed in their quest, there’s a very real chance everything we think we know about Luke’s journey to becoming a Jedi could change. As a Star Wars lore buff, I couldn’t be more interested to see where this story goes. It’s hard to call a first issue perfect but Kieron Gillen comes about as close to the line as you can get. By design the writer’s goal is to leave you in a place where you’re asking questions and wanting more, which at times can lead to feelings of frustration and impatience, especially if you’ve got too many questions. You’ll be hard pressed to find anything close to that here. Upon finishing this issue I found myself exactly where I wanted to be; wanting more, asking questions, anxious for the next issue to arrive and experiencing that special feeling that only a Star Wars story can deliver. It's hard to call a first issue perfect but Kieron Gillen comes about as close to the line as you can get.